Oldcastle Precast appointed Kirk Randolph to executive vice president, Strategy and Development, leading the acquisition and integration of new businesses, while spearheading growth initiatives. “Kirk possesses a solid understanding of our business and his experience in acquisitions and divestitures will be a great asset as we execute our growth strategies,” notes Oldcastle Materials CEO Randy Lake. Randolph has served as Central West Division president since August 2006, and was president of the APAC operations Oldcastle Materials acquired from Ashland Inc. Prior to executive appointments with the Southeast aggregate, asphalt, concrete and road-building business, he held various positions, from estimator to vice president to head of Major Projects Group. Randolph holds a B.S. in Civil Engineering from the University of Missouri-Rolla, and began his career with APAC as a surveyor and assistant superintendent. He has nearly 20 years’ experience in ready mixed, aggregate and asphalt production, along with companion construction activities. “Our customers have been requesting that we add RCP to our product offering [and] we expect to be operational by the fourth quarter of 2014,” adds Vice President of Sales Phil Felten. U.S. 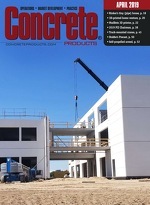 Concrete Inc. has added to its west Texas business, Ingram Concrete LLC, three plants and 24 mixer trucks by acquiring the assets of City Concrete, Inc. in Wichita Falls and Pitts Ready Mix of Burkburnett. Brownwood-based Ingram Concrete and Dallas-Ft. Worth-centered Redi-Mix Concrete provide U.S. Concrete a strong Texas platform. Wisconsin-based Spancrete has joined AltusGroup, a partnership of 17 precast companies, to market CarbonCast Enclosure Systems in the Midwest. Spancrete will produce CarbonCast High Performance Wall Panels and Insulated Architectural Cladding at its Waukesha plant near Milwaukee. By incorporating C-Grid carbon fiber reinforcement, CarbonCast technology nets precast concrete lighter and more than four times stronger than members fabricated with conventional steel reinforcement. Past (1994) National Concrete Masonry Association Chairman Bill Oberfield, whose business is synonymous with Ohio block, was recently presented the NCMA Lifetime Achievement Award. Since Oberfield’s Inc. joined NCMA in 1974, he and his family have supported the association and industry through product, technical and executive committee work, plus contributions to the NCMA Foundation endowment. NCMA credits Oberfield with recruiting more members to the association than any other producer in the group’s nearly 100-year history. Ohio-based Snyder Brick & Block will incorporate CarbonCure carbon dioxide-sequestering technology at its Columbus and Monroe plants. When added to the unit masonry molding process, post-industrial CO2 is converted back into a mineral, enabling producers to promote block or pavers with unique environmental value propositions. “We’ve made the decision to promote and manufacture low-carbon products so we can appeal to sustainable construction projects, while contributing to a positive long term impact on future generations,” notes Vice President Mark Synder. The producer’s newest operation also features a rainwater collection system, tapped for certain mix designs and other recycling measures. Following appointment of Jerry Hoyle, president and CEO since 2011, to a new role combining the latter title and vice chairman post, packaged dry mix specialist CTS Cement Manufacturing Corp. in Cypress, Calif., has announced a new executive structure around two divisional groups. Frank Senatore will assume the position of president Retail and International Sales, with Ken Vallens becoming his counterpart over Engineering Sales and Research. The CTS board created the divisional groups, each focused on major growth opportunities and equally supported by production and operations, as part of a change in executive structure. The Senatore and Vallens appointments reflect an established blueprint the company uses for executive development.